What about those FIRST LADIES? Here's some interesting first lady trivia (at least it was interesting to me). **George Washington’s wife, Martha Washington, was the first to be given the title “lady” by the press, as in “Lady Washington,” and the first wife of a president to appear on U.S. postage stamp. **John Adams’ wife, Abigail Adams, urged her husband to “remember the ladies” when he was writing the nation’s Declaration of Independence in 1776. She also was the first woman to be both a president’s wife and the mother of a president, and the first to live in the White House. **Abraham Lincoln’s wife, Mary Lincoln, was the first to hold séances in the White House, to be attacked in the press for lavish purchases during wartime and to fight for the abolition of slavery. **Warren G. Harding’s wife, Florence Harding, was first first lady to vote, fly in an airplane, operate a movie camera, own a radio, and invite movie stars to White House. She also was accused of poisoning her husband, who died during his third year in office. 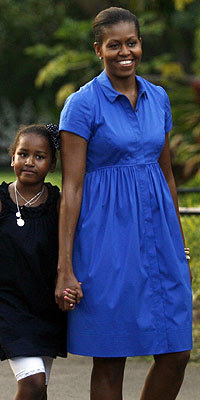 **Barack Obama's wife, Michelle Obama, is the first First Lady to have given birth in the 21st century. She definitely knows how to dress for her body shape. I love style stalking her! My kids are stuck at home too. That Florence Harding rocks! Happy Presidents Day! I had never thought about Michelle's style but that was so fun to see. She's got it goin' on, no? Fun!!!! 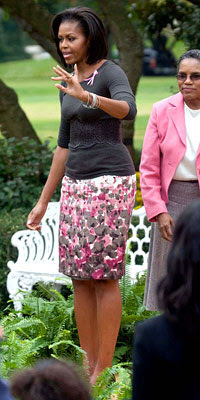 I love the style Michelle Obama has brought to the Whitehouse...no more old lady suits! I like your trivia(l) entertainment and the Michelle Obama pics! Very interesting tidbits. I'd never heard of the National First Ladies Library. I can't wait to check it out. On my way now! Thanks! I love her avocado green top. Wonder where that was from? She does wear a lot of J Crew. I think Harding sounds awesome. I like style stalking her too. She's classy. Sometimes she over does it with the belts, but she still has style. I love the photo of MO in that citron ruffled silk blouse. Gorgeous. Woo hoo for President's Day! I was off from work too. 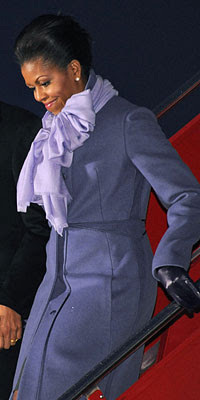 Love Michelle Obama's style - sophisticated, yet approachable. Love her! Hope you had a great weekend! It's always nice to have the little darlings home during the week, don't you think? (It should be illegal!) I'm sure you had a lovely day. Thank you for sharing your stalking with us. Come visit. she's a cool mom and hip first lady! This was great! I'm such a fan of random trivia. I heart Michelle! She has the BEST fashion sense. Mary Lincoln sounds like she'd be fun to have a cocktail with on a Saturday night! I'm personally tired of seeing that woman everywhere. She is not exactly groundbreaking. Are you going to join the Spring Capsule Wardrobe Challenge? Love the trivia - stuff you didnt knnow you wanted to know!! I love Michelle's style, well not so much the pants outfit, but everything else! I love this post. Thanks for sharing!